Pilot Flying J founder James Haslam II and several company executives held a press event at the company’s headquarters in Knoxville, Tennessee, on November 1 to announce that the truck stop giant would be spending the month celebrating its 60th anniversary. No, no, they weren’t angling for anyone to go out buy them gifts. Even a card isn’t necessary. Quite the opposite, in fact. For starters, the company wants to treat all those who serve or have served in the military to a Veterans Day breakfast. From November 10–12, active-duty and retired military veterans can redeem an offer on the Pilot Flying J app a free Pilot coffee of any size with their choice of a PJ Fresh breakfast sandwich, packaged pastry item or a Cinnabon Center of the Roll. The app is available through Google Play, Apple’s App Store and under the “Rewards Programs” heading on the the Pilot Flying J website, pilotflyingj.com. 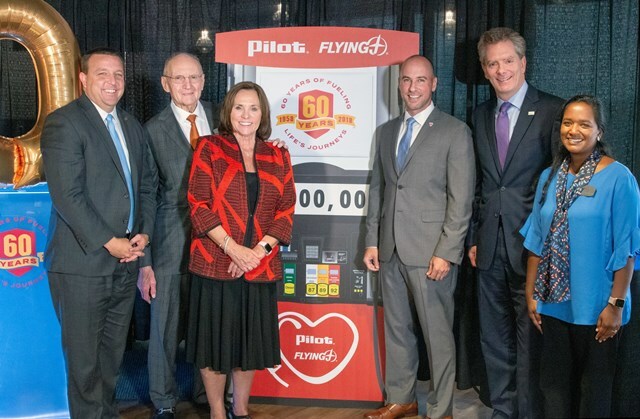 More than 20 nonprofit organizations will receive contributions, each reflective of causes that are important to Pilot Flying J’s guests and team members and the values upon which the company was built. In keeping with Pilot Flying J’s support of veterans, organizations such as Hire Heroes USA, Bunker Labs, Fisher House and Folds of Honor are among the organizations that will receive donations. Organizations like Boys and Girls Clubs of America, Feeding America, Dolly Parton’s Imagination Library and Trucker Buddy International will also receive donations to fund programs that focus on health and wellness, access to food and academic success in communities across the country. To learn more about Pilot Flying J’s 60th anniversary celebration, visit pilotflyingj.com/giving-back.